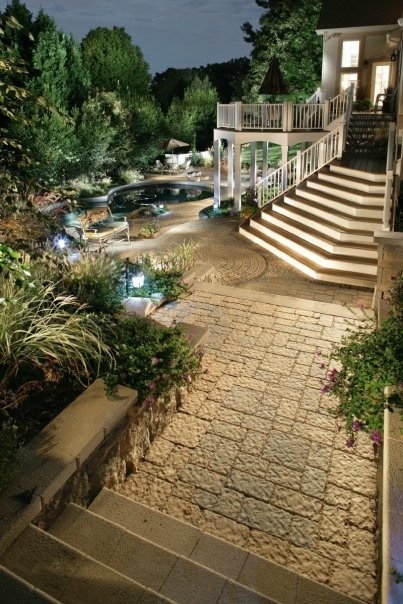 Pool & Deck with Grand Staircase Vienna VA - Land & Water Design, Inc.
Good landscape design can nudge people in the direction you want them to go. In this case, we created a series of grand staircases to draw guests through the property to enjoy the pool. 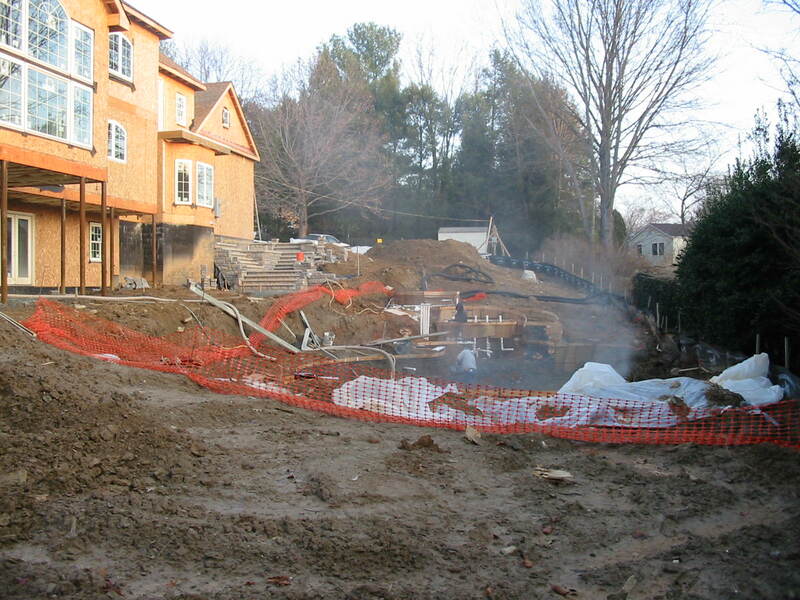 This challenging site near Wolf Trap had an existing, tired swimming pool at the end of the property. 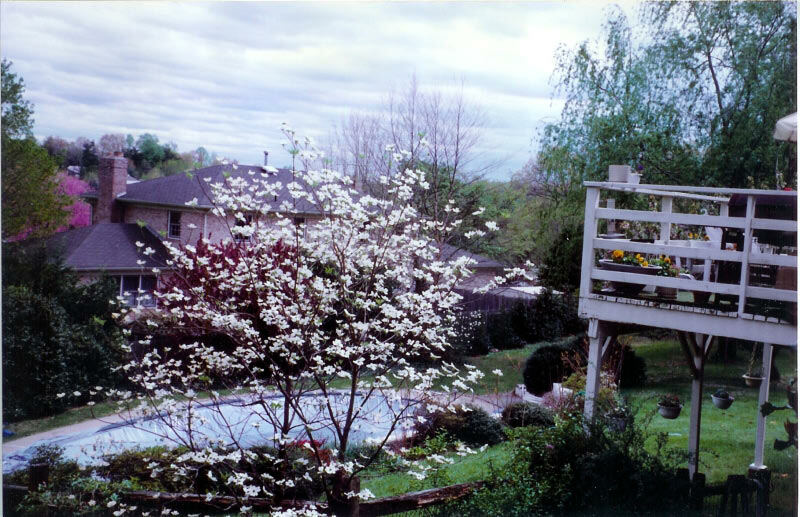 With twelve feet of grade change across the backyard, our landscape design dilemma was; how to connect the new pool with the house, create lots of living space, and still get people to the landscape below. The entire rear of the house was renovated, giving us an opportunity to build a new multi-level deck. We crafted a covered living space under the deck and sunroom, which also provided ample landings that draw visitors to the pool. To encourage guests to leave the deck and enjoy the pool below, we built an elegant and flared main staircase. The new swimming pool curve’s echo the curves of the steps in the patio on one side and flow with the contours of the site on the other. Techo-Bloc pavers and composite decking are surfaces that will last for years to come and complement the home’s details. Two features make this pool stand out: the stone dive rock at the deep end and the natural stream bed with waterfalls that cascades into the pool at the other. These features create backyard resort living in Vienna, Virginia. Are you ready to plunge into a pool and landscape project of your own? 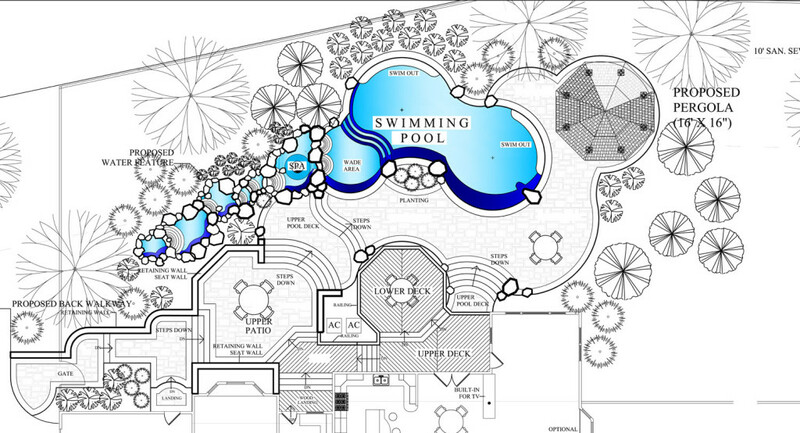 Contact us today to learn how Land & Water Design can make your backyard dreams a reality.